Rubberfast have supplied roller coverings for many years. This usually involves vulcanising a rubber compound to a free issue roller. Capacity varies from small rollers/wheels used in packaging to large bakery and carpet rollers. (These have different properties and are used to best suit the requirements of a specific application. i.e. resistance to temperature, chemicals, abrasion, oil, ozone etc. Drive Rollers - Used in all industries for driving conveyor belts. Conveyor Rollers - Gravity and driven rollers. 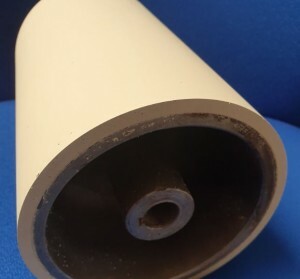 Print Rollers - Usually Nitrile rubber is used for these rollers which are in wide use on packaging and paper industries. Abrasion Resistance - Hard wearing compounds like textractor, hypalon and carboxyllated Nitrile for heavy wear applications. E.g brick and tile industry, quarrying and mineral processing. Food Rollers - Most of the compounds are available in food quality rubber often to FDA and BGA standards. Crowned, Helical, Spiral - To help with tracking. Chevron, Diamond, Helical - To help with drive. Precision Ground - To extra fine tolerances.